Qa ALLUVIAL; loose sediments, clay to boulder sized, Holocene to Recent in age, up to 10 m thick. Qs SUAI FORMATION; Weakly consolidated coastal deposits consisting of cobble, sand and silt, contain foraminifera and molusc fossils, supposed to be Late Pleistocene – Recent on the basis of the stratigraphic position and the gentle deformation, it was deposited I the litoral to epineritic environments. Approximately 600 meter thick. Qps SUREBECO FORMATION; limestone, thicly bedded, contains gastropods and algae fossils, locally are found travertine and chalky limestone. The unit is Pleistocene to Recent in age and it was deposited in a lacustrine environment. Thickness up to 20 meter. Qpb BAUCAU LIMESTONE; Coral reef with alternations of calcarenite; unconformably overlies the Viqueque Formation suggesting Pleistocene – Recent in age; with shallow marine depositional environment, thickness up to 100 meter. Qpa AINARO FORMATION; Old river deposits forming terraces; consists of polymict conglomerate, sand and clay; weakly consolidated, based on stratigraphic position supposed to be Pleistocene in age; approximately 100 meter thick. Qtv VIQUEQUE FORMATION; Marly conglomerate, thinly bedded claystone with intercalations of chalky limestone, tuff, silt and sandstone; a lot of foraminifera in marl and sandstone; Pliocene – Pleitocene in age, deposited in a lithoral to epineric environment, more than 800 meter thick. Qtb BOBONARO FORMATION; Chaotic rock with scaly clay matrix and blocks of older rock, possibly Upper Miocene to Recent in age, contains foraminifera. It was deposited in deep marine environment. Thickness of unit is different from one to another places. Tps SEKOTO FORMATION; Clayey marl, grey and white coloured, consist of block of Viqeuqeu Formation, contain foraminifera, Pliocene in age. It was deposited in a deep see environment. Thickness of the unit is more than 20 meters. Tpd DILOR FORMATION; Poorly sorted conglomerates and sandstone, abundant of fragment of Lolotoi Formation, contain foraminifera, Pliocene in age. It was deposited in an epineritic to deltaic environments; thickness up to 300 meter. Tml LARIGUTI FORMATION; Calcarenite and reefel limestone with bioherm structures, contents of foraminifera, Late Miocene in age. It was deposited in an epineritic environment. The thickness of the unit is up to 75 meters. Tmc CABLAC FORMATION; Calcilutite, oolitic, calcarenite and conglomeratic limestone, contain foraminifera, Early Miocene in age. It was deposited in an epineritic environment. Thickness of unit is more than 600 meters. Tma ALIAMBATA FORMATION; Poorly bedded limestone, contains abundant foraminifera, Early Miocene in age. It was deposited in a shallow marine environment. Thickness of the unit is more than 100 meters. Tob BARIQUE FORMATION; Agglomerate, basaltic tuff, lavas and contains of limestone fragment derived from the Dartolu Formation, Oligocene in age. It was depoited in an epineritic environment. Thickness of the unit is more than 300 meters. Ted DARTOLU FORMATION; Thickly bedded, biocalcarenite, contain of foraminifera, Eocene in age. It was deposited in an epineritic environment. Thickness of the unit is up to 300 meters. Kb BOROLALO FORMATION; Thickly bedded or massive limestone,with chert intercalation and calcareous shale, contains of foraminifera, Cretaceous in age. It was deposited in a deep sea environment. Thickness of the unit is more than 200 meters. Jw WAILULI FORMATION; Dominated by sandstone, shale and limestone intercalations contains belemnites and ammonites, Jurassic in age. It was deposited in a shallow marine environment. Thickness of the unit is up to 1000 meters. TRa AITUTU FORMATION; Well bedded calcilutite with chert nodules in some place, locally calcarenite, shale and thin alterations of marl. Contains abundant radiolarian and halobia fossils and minor ammonites, Late Triassic in age. It was deposited in an epineritic environment. Thickness of the unit is more than 1.000 meters. Pc CRIBAS FORMATION; Sandstone with clay ironstone nodules and limestone, shale, contain Atomodesma fossil, Late Permian in age. It was deposited in an epineritic environment. Thickness is up to 500 meters. Pm FORMASI MAUBISE; Bedded biocalcarenite limestone and reefal limestone, contains of abundant Crinoids, Algaes, Brachiopoda, Chepalopoda and Globiella foordii (Etheridge), reddish colour, Early Permian in age, deposited in the shallow marine environment, with thickness of the unit is up to 500 meters. Pa ATAHOC FORMATION; Black shale with lamination structures and basaltic rock. The lower part is massive and unfossilferous with intercalations of sandstones, massive quartz and black shales, the upper part consist of basaltic lavas with amygdaloidal textures, contain Trilobite fossil, Early Permian in age. It was deposited in the shallow marine environment. Thickness of the unit is up to 500 meters. pPl LOLOTOI FORMATION; Weakly-medium metamorphosed rocks from sedimentary rock and gabrroic doleritic eruptive rock, consists of phyllites, schists and gneisses, strongly fractured, pre-Permian in age, up to 1000 meter thick. The Baucau quadrangle is located in the eastern part of Timor Island and is a part of subduction zone between Australia Continent and Banda Arc subduction zone. The collision occurred during Miocene – Pliocene time the rock in Timor can be devided into three lithotectonic units. Parautochtonous of which derived from the Australian Continent. Autochtonous unit which was deposited after the collision. The Allochtonous units are not found in the baucau Quadrangle but it can be found in the Dili, Kupang and Atambua Quadrangles. The Parautochtonous unit was deposited in the Permian to Triassic times. In the Jurassic time, the Parautochtonous was deformed to produce folds trending NE-SW. The Allochtonous unit was formed in the Cretaceous to Miocene times. Tectonically, the Allochtonous units was transported and overlying the Parautochtonous units in the Early Neogene time. 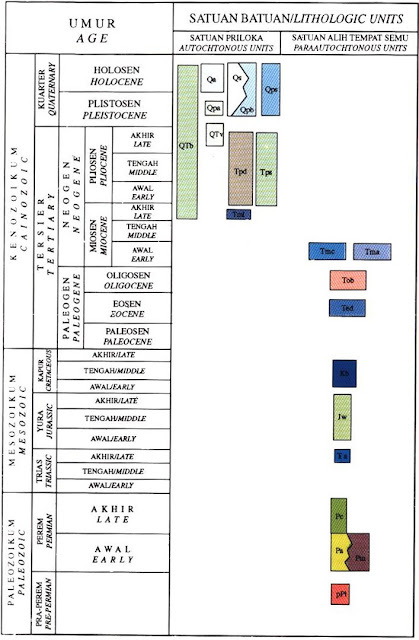 The Autochtonous unit was deposited on the Parautochtonous and allochtonous units since Late Miocene to Recent. The Baucau quadrangle has potential mineral and energy resources, as follow: Gold is found in Ossu, Ossaola and Lacluta district. Copper is found in Ossaola and Lacluta district. Ocer is found in Llliomar district. Phospat is found in Macaloso Mountain. Travertine is found in Buruma district. Gypsum is found in Lalela district. Bentonite is found in Venilale district. Oil and gas seeps occur in several places. E. Partoyo, B. Hermanto and S. Bachri,. 1995, Geological Map of Baucau Quadrangle.